Philosophy is one of my favourites when it comes to skin and body care. The scents they create are delicious and the packaging is just lovely and simple. 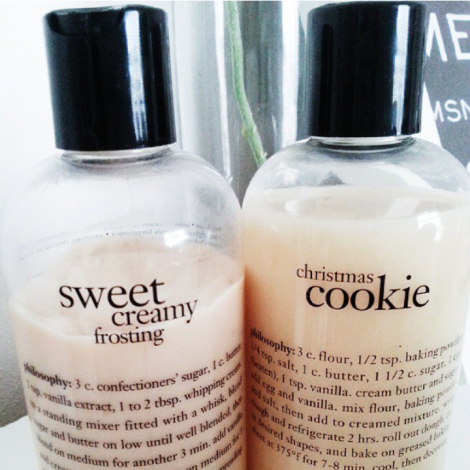 Two of my favourites from Philosophy have always been the Sweet Creamy Frosting body lotion and the Christmas Cookie shower gel/shampoo/bubble bath. The Sweet Creamy Frosting body lotion is my favourite. The scent is sweet and sugary, something I really like in a fragrance. It applies nicely and the smell barely fades, leaving you smelling like a yummy cake! It's great for keeping my skin hydrated and has lasted me such a long time. Christmas Cookie smells equally as yummy. I use it as a shower gel more than a shampoo. As a shampoo, I find it to be slightly soapy, leaving my hair with an unusual feel. However, as a shower gel I adore it. The scent is incredible. Really sweet...I almost want to eat it.. seriously. I loved these so much that I had to get some spares even before I'd barely run out. They're lovely!